As a business in our city, you know the value of giving back and building into our local community. When you join UGM Dallas as a corporate partner, sponsor an event, or encourage your team of employees to volunteer as a group, you help change lives for the better in our community. We are blessed and very thankful for the many companies in the Dallas area who lovingly support the work of UGM Dallas. One of the most sacred blessings a company can bestow on the Mission is a chance to do an honest day’s work. Please consider hiring the men and women who have completed our 18 month to two-year rehabilitation program. This type of giving is the start of a new life for one individual. 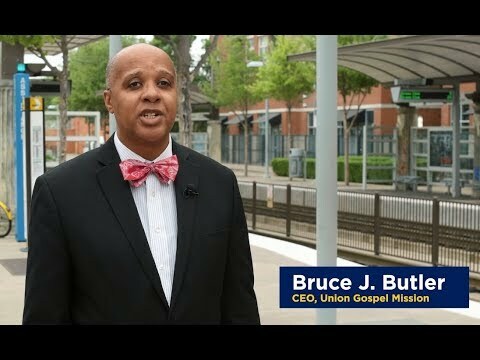 A wonderful testimony of how businesses can partner with UGM Dallas is exemplified in the relationship with Dallas Area Rapid Transit (DART). For the past 22 years, during Christmas, Dallas Area Rapid Transit (DART) has led a Friendly Food Fight among their employees to raise money and collect food to donate to the UGM Dallas. HALCON, a DART contractor, continues to hire UGM Dallas disciples as mainline train cleaners upon completion of the Discipleship and Work Training Programs. The UGM Dallas disciples have received salaried positions with the opportunity to receive benefits.